If you fell off a horse, you’d probably be pretty traumatized. You might not ever want to get on another horse again. But if riding was important to you, you’d have to get back on the horse eventually. And it would probably be good to do it as soon as possible, because the longer you avoid doing something that scares you, the more frightening it becomes. Sandra Bullock didn’t fall off a horse, but she did have a traumatic experience. She learned that her husband was cheating on her, and she went through a painful divorce. After that, she was nervous to go back to her old life of acting and being in the spotlight. But she had to get back on the horse. Sandra found the perfect opportunity to get back on the horse with the movie Extremely Loud and Incredibly Close. In the film, she plays a widow and mom who has to find a way to get back on the horse and face life after her husband is killed in the terrorist attack of 9/11. Sandra may be back on the acting horse, but that doesn’t mean she’s ready to start dating again. After her traumatic break up, it might take her a little longer to get back on that horse. 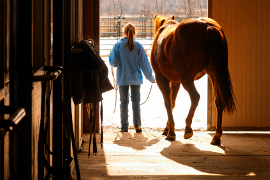 Have you ever had to get back on the horse after a difficult experience? What advice would you give Sandra Bullock to help her get back on the horse and start dating again? return to do smth after some brake. try again the work which you didn't do for long time. To attempt the same challenging action after failure, but it can also mean to get back into a habit. do the same thing that you do before. To continue trying something that one has had difficulty with in the past. It's you do it again after you fail or lose something. julito and IRENE FOREVER I would give you 10 times “Like” if there was a function to do that. julito, for some mystical reason you talk in your comments about the troubles I have in my life now. This lesson has the second comment you made about that subject. Many lessons ago I found first comment you made exactly about the subject, which bothers me so much. Paradox! Yeah, for that guy is a long way to get back on the horse, if chiropractic helps. IRENE, thanks for sharing. I am myself a great admirer of Dale Carnagie . How he put things in perspective.!!! Never be a captive of your past, circumstances or situations, because life would be torturous and unbearable. i beleive that everything happens for a reason no matter how tough it is, every time you stumble, fall down…just take a deep breath and get back on the horse . IRENE , I have a friend who lives in Sao Paulo, Brazil. He is a Pai ,it means Father, He does a lot of social work and a spiritual counselor and has many disciples .When couples go to him and say that they are divorcing ,he tells them, don´t do that now , first you have to come with me for two weeks to the oncologic hospital and do service there. After that time they raraly divorce ,after seen the serious problems that patientes have to bear they understand that theirs are nothing in comparission. Apple, at my age I try to live a tranquil life, The fast lane I leave it to the young . In the end, everyone should go back on the horse and try riding it once again in order to create their next journey. Just, remember to create the dreams too. Cherish whatever you got now and be grateful. Happiness is in you ;not from outside world. The biggest enemy is our self.